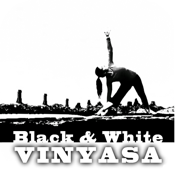 Black & White Vinyasa is designed for a student who has taken at least 20 vinyasa flow classes. The video image is high contrast black and white. The verbal cues are should be enough to guide you and the flow, floweth! These classes will move you! Be prepared to sweat and move quickly though warm ups, sun salutations, standing postures and more. This class is meant to be challenging! Balancing poses are tough. They take an incredible amount practice, patience, strength and flexibility. The aim of the yoga practice is to find the balance between effort and relaxation and we put our bodies into these unique positions to observe how we respond under stressful conditions. The postures themselves are not the means to the end: maintaining grace under pressure however, is! One of my favorite definitions of yoga translates to Mastery Of The Mind. The yogi aims to merely observe without preference. To watch what is happening and to react with a steady, relaxed breath and calm mind. No preference, no judgement, just that steady inhalation and exhalation regardless if you are doing down dog or side crow. If you are new to yoga, please download the app titled Yoga 101 first. It’s a free class that will give you a solid understanding of the basics of the yoga practice, as well as teach you the proper breathing technique used. Myyogaminute.com mission is to inspire 400,000,000 people to do yoga by the year 2020. If you enjoy this app, please share it with your friends and family! For more information on yoga and yoga related apps, check out myyogaminute.com.